An Advanced Search is useful if you do not know the plat citation (such as the plat number of the plat book and page number). 1. To perform an Advanced Search, first navigate to an individual county page by clicking on a county in the drop down list titled, SELECT COUNTY from the home page. 3. 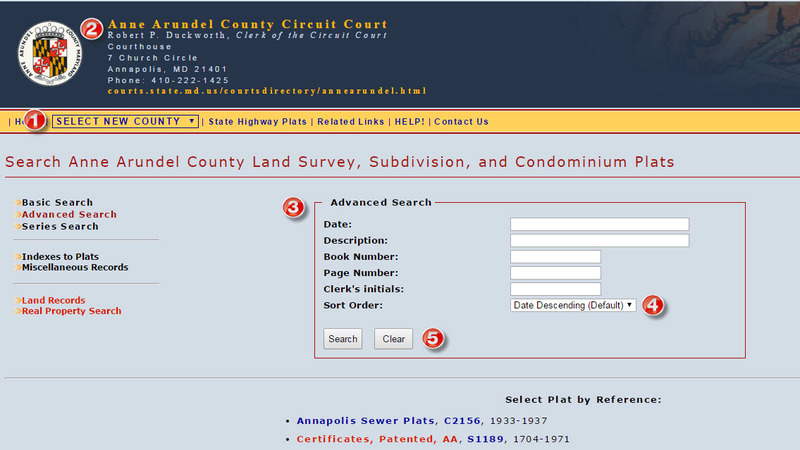 By default the Basic Search option will be available when first accessing the main page for a specific county. Click the Advanced Search option located on the left side of the screen. Enter in a keyword to one or more of these boxes and click the Search button. Keep in mind that this is an exact search and will only find records containing the word or phrase entered in the search field. One option for doing an Advanced Search is to search by the name of the subdivision in the Description field. You may be able to find the subdivision name for the property in the deed for the property, which can be found on the Archives' MDLANDREC.NET website, or on the State Department of Assessments and Taxation (SDAT) Real Property Search website. 5. The Clear button allows you to clear the search form.